A toothache is never a pleasant experience, and the cause of the pain can be one of many possibilities. There could be tooth decay present, and dental work (such as filling a cavity) may be the remedy. It’s possible that the tooth has fractured, or maybe the pain is coming from sore gums and not from the tooth at all. To really know what’s going on, you’ll need to schedule an appointment with a dental office — the sooner, the better. In the meantime, there are measures you can take to soothe the pain. 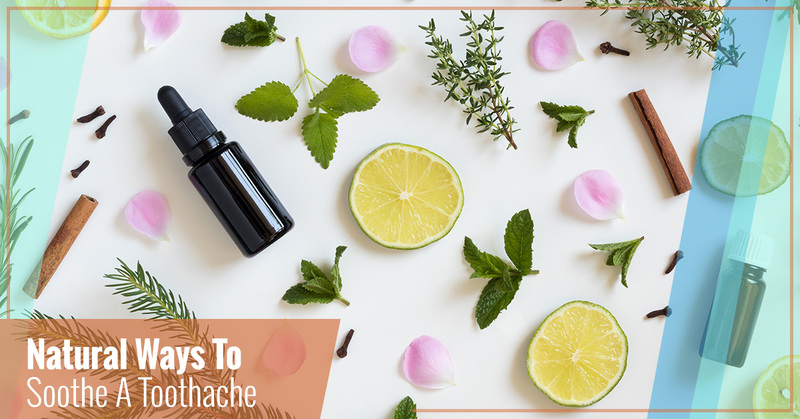 Here are a few ways to calm toothache pain naturally. Some may work better for you than others. But please remember: Not all natural remedies are effective or safe. Before trying something a friend suggests or you think might work, check with a dental care specialist to see whether or not it’s safe and recommended. Remember to schedule a dental appointment at your earliest convenience, and if the pain is intense, seek the help of an emergency dentist right away. If inflammation or an infection is present, a salt-water rinse can be relaxing and effective. It can reduce the ache and calm down the inflammation. Add half a teaspoon of salt to a glass of water, and rinse your mouth with this solution as you would with any mouthwash. Make sure you don’t swallow it! Like salt, peppermint has soothing properties. You can make use of this herb in one of several ways. 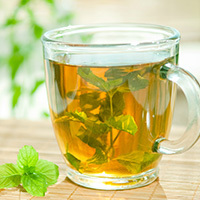 One is to slowly drink a cup of peppermint tea, taking your time and swishing the warm liquid around in your mouth so that it reaches your sore tooth. Another thing you can try is placing a peppermint tea bag (that you’ve presoaked in hot water and let cool slightly) directly on the tooth or area of your mouth that’s in pain. Or, you can try peppermint oil; simply apply a couple of drops on a clean finger and rub it gently around your sore tooth. Another natural oil that may alleviate your pain is clove oil, which has anti-inflammatory properties and can reduce inflammation-related pain. As with the peppermint oil, apply a drop or two on a clean finger and gently rub it on the affected area. As with other injuries, a cold compress applied to the affected area can reduce inflammation and relieve pain. You can apply it on your face near your toothache. Just remember to wrap the compress in a towel or other cloth to avoid getting frostbite on your face. Slice up a cucumber that’s been in the refrigerator, and apply a slice directly onto the affected area. Put the remaining slices in the refrigerator; once the slice in your mouth has warmed up and lost its soothing effect, replace it with a fresh new slice from the fridge. Take a clove of garlic, crush it slightly, and place it between your cheeks and gum next to the affected tooth. Garlic has natural oils that fight disease and relieve pain. Give it a try. Pressure applied gently on different parts of the body can reduce the sensation of pain. One of these pressure points is located in the space between your thumb and your index finger. Gently apply pressure to this area to reduce the level of pain you’re experiencing from your sore tooth. These suggestions provided in our blog offer temporary relief, which can be extremely helpful. But in most cases, you’ll need to make an appointment with a dental practice to uncover the source of the problem and treat the pain. At Smile Designers PC in Longmont, we are dedicated to providing top-quality dental care to our patients through gentle dentistry and the most effective dentistry techniques available today. Our services include restorative treatments that repair teeth and bring back your smile, as well as gum treatment (periodontics) that may be causing you pain. We’re also available for emergency dentistry services, and we urge you to call us at (720) 306-9941 if your toothache is intense or getting in the way of your daily tasks. Reach out to us today.